Follow Us on Facebook for the latest news and all Upcoming Events. The Fairview Fine Arts Center is very pleased to receive a Lovsin grant through the Northwest Community Foundation. The grant was presented by Frank and Agnes Lovsin at their Peace River Freson Bros store on November 27. The grant is to go towards a new, energy efficient kiln for the pottery studio. Thank you the Lovsins and for all those shopping at our local IGA. Tracey Vavrek with Frank and Agnes Lovsin presenting the Fairview Fine Arts Society with a Lovsin Grant towards the new Potters’ Guild Kiln. Membership Renewal is due. Please stop by the Centre to renew your membership for the upcoming year. Space Planning Committee: Members Needed. It would be tremendous if we had a representative (or two) from each guild to meet and discuss how we can best meet the needs of all the members and guilds for storage space. If you are able to help in any way, talk it over with your group and please let Gloria know ASAP. These courses will be scheduled when we have enough interest. For more information, or to sign up on the waiting list, please phone us at 780-835-2697. This course is open to artists of all kinds. 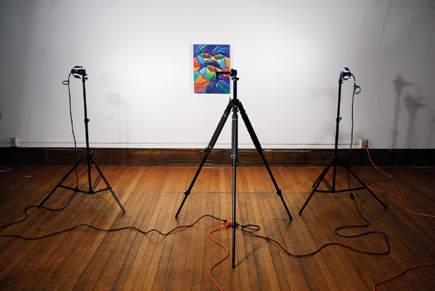 In it, we will learn the basics of photographing your artwork - both two-dimensional and three-dimensional objects. Learn skills to advertise and sell your own masterpieces, or to simply archive your child's beautiful creations. Have you or your children wanted to try out the social benefits of the arts, but have found participation fees a barrier? To enhance, develop and encourage arts, crafts and culture in the heart of the peace. To be the heart of cultural & artistic experiences. Sign up to our newsletter to receive news on gallery events & upcoming classes.